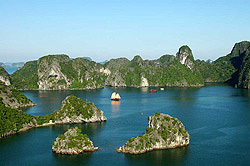 We offer the highest-quality kayaking tours of Halong from 2 to 5 days in length. The three-day tour is a nice compliment to our cycling tours or as a short side-trip from Hanoi. Seafood cuisine and long-distance transport are on one of our "mother ships" - cruising boats equipped with comfortable, private cabins and lavatories with spacious top deck and dining room. Small groups on our 8 or 3-cabin boats are served by a crew of 5 including a talented chef and lead by a internationally-licensed kayaking guide with minimum of 5 years on the bay. Meals are abundant and delicious, highlighting local seafood cooked up fresh. Vegetarians can also be accommodated. Private tours may alter the itinerary to their desires, although our shared boat will have plenty of options for swimming, hiking, exploration of floating villages and other activities aside form kayaking. Note: Our Halong Bay trips are only offered as extensions to our longer cycling trips or for private groups. Are we in a James Bond movie (that would be Goldfinger)? After omelettes, tasty soup, bread, butter, jam and a strong jolt of that delicious Vietnamese sweetened coffee, off for a full day on the bay, exploring grottos, coves, inland lagoons, and empty white-sand beaches. Also options for island hiking, visiting floating villages and swimming in beach coves or lazing on the deck. Lunch, dinner and overnight on boat. Another beautiful, tranquil morning on the bay. Half-day kayaking and other activities by preference. Farewell banquet lunch with crew while returning to Halong port. After, return by private car to Hanoi, arrving late afternoon at your hotel. Landcost (2-3 days): From US$380 per person (based on four people, discount for larger groups), including all freshly-cooked meals, bottled water, accommodation, professional kayaks, experienced kayak guide, instruction, and transportation to and from Hanoi. Private boat tours start at $1,580. 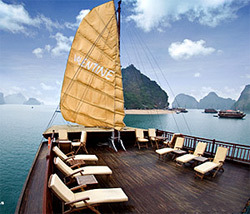 Accommodation is on the one of the few good boats that ply the bay [see the finest boats on Halong]. Click here for our packing list.